“If we could do it again, we probably would!” That the was the last thing Hayley said after I asked her about her wedding day. This couple are just so in love, you can really tell from these beautiful images captured by Jay Mountford and second photographer Claire Penn, just how much this couple wanted to be married. Their day was beautifully laid back and totally reflected both their hobbies and personalities, taking inspiration from all the wonderful places the couple have visited together – simply wonderful! It was important to me that we married in Herefordshire, I grew up in the county and I still have family that live in the area. 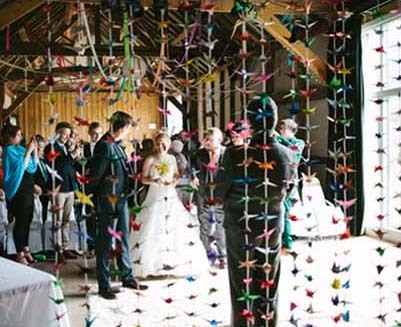 It was also important to Chris as he felt that such a beautiful area would be the the ideal location for a good old knees up in a lovely rustic barn, without the bells & whistles of a manor house. Hellens Barn was just that, full of character but blank enough for us to make our mark in terms of decorations. It was also important for us to have a nice outdoor space so everyone could enjoy the fantastic scenery & capricious English weather. We did most of the decorations ourselves as that’s what we like doing. The centerpiece of the day was a backdrop of 1,000 origami cranes which took us about a year to make. It’s a Japanese tradition that confers either good luck or a wish to the people that create it. Japan is a significant place for both of us as we spent the first three years of our relationship living there. We also wanted a lot of colour & we hit upon the idea of making the inside of the barn look a bit like a Mongolian yurt as we spent an exhilarating (& slightly smelly) holiday there. This involved a hula-hoop suspended by fishing wire from the ceiling with coloured paper streamers radiating out to the walls. This feat of engineering was executed with deft manly ingenuity by the best men, master of ceremonies & my Dad. Keeping with the home-made theme, the flower-girl’s dresses were made by the combined efforts of my mum & aunt, who had to be specially flown in from Australia. It was important that the girls chose their own colours to wear & they did. Our chair covers were provided by Chair Covers for Brides & the flowers were supplied by Wiggly Wigglers, a local supplier who supplies all the flowers and materials with instructions on how to create your own bouquets & buttonholes. We were immortalised by the fabulous Jay Mountford whom we met at a friends’ wedding & instantly clicked with. We couldn’t have chosen a photographer who suited our sensibilities & sense of childish fun more & she worked wonders with keeping people at ease & took great pictures. She also had a bit of a boogie afterwards, which was great to see. I loved having Jay there to take pictures whilst we were getting ready. Jay kept me cool & calm in the midst of the chaos & excitement surrounding me. Jay’s colleague Claire Penn documented the groom’s party getting ready & clicked well with Chris, the best men & master of ceremonies, also taking fantastic pictures. We both said that our favourite moment was the minute we saw each other for the first time as we both became instantly relaxed and we could really start enjoying the day. Getting married with all its preparations is massive & the night before you really want to be with your best friend – the fact that we were apart was exciting in a romantic & traditional way, but also added to the nail-biting, which completely dissipated once we were together again. If we could give advice to anyone getting married it would be have fun do your own thing as it’s about YOU! Don’t you just love the thought and passion that have gone into creating each of those origami cranes! I love the idea of having different tables representing all the places that mean something to you as a couple, the ‘Russia’ table has to be one of my favourites! Thank you so much Hayley and Chris for letting us share such a special day. We would also like to say a huge thank you to the absolutely darling Jay Mountford and Claire Penn for taking such fabulous photos! Oh! I was all set to say that the older hands fastening the back of the dress was my favorite shot, then I saw the little girls whispering secrets, and it was going to be that one! But then the shoes, and those vintage fabric ties. Of course the colors in the swoopy crepe paper ceiling bit and then the origami wall. Well it all just kept going and in the end my favorite was how happy the whole thing made this complete stranger. Beautifully conceived and masterfully captured. Many happy returns to all! There are just so many amazing shots here aren’t there it’s impossible to pinpoint one. Thanks for such a lovely comment I know Hayley, Chris, Jay and Claire will all be very pleased with your comment!